Gustav Klimt is one of my favourite artists and just seeing one of his art pieces hung on the wall makes me happy. Pardon the poor quality, but it was taken with a phone camera. 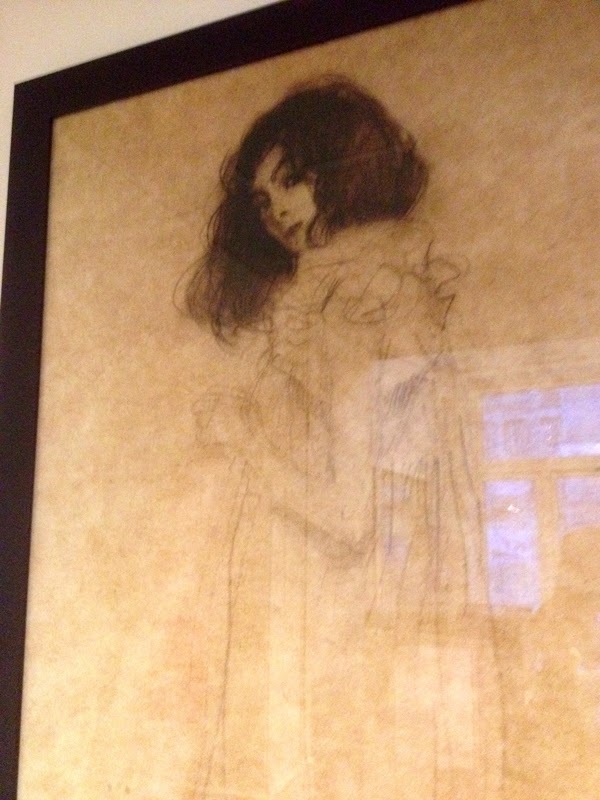 What amazes me about Gustav Klimt is that he has this amazing ability to capture the fragility of his female subjects. Look at how thin and fragile the arm is, and the delicate bone structure of her cheek and nose. She looks on the border of being anorexic. The soft lines of the nightgown just melts the heart towards her - I want to hug her. At the same time, she looks almost defiant in her eyes, defensiveness shining through. Don't you dare touch me, her eyes say. I can take care of myself. I am learning to decipher the intricacies of facial features of human beings now. What does the face really say about the person? Why is she standing like that? It seems she wants to protect herself. But then, maybe she is a reflection of me. The way I see her is the way I see myself. Or maybe it is a past self - someone I was and recognised, but I have moved on. I must apologise to my readers that for the past year, I did very little with my blog. It was mostly because I had a lot of internal work that needed to be done, and three of the people closest to me passed away. I had a lot of self-reflecting done, exploring my relationship with men, and my own animus (which according to psychologist Carl Jung, is the inner man in me). With that, my dears, I leave you to think. I cannot promise that I will reply every comment, but I will check them regularly and answer in my blog when possible.